Through Darkest Zymurgia is a fantasy adventure novel set in a "faux-Victorian" world. My scratchboard-style cover illustration, depicting the heroes' pivotal moment of discovery, echoes the engraved illustrations of period newspapers. 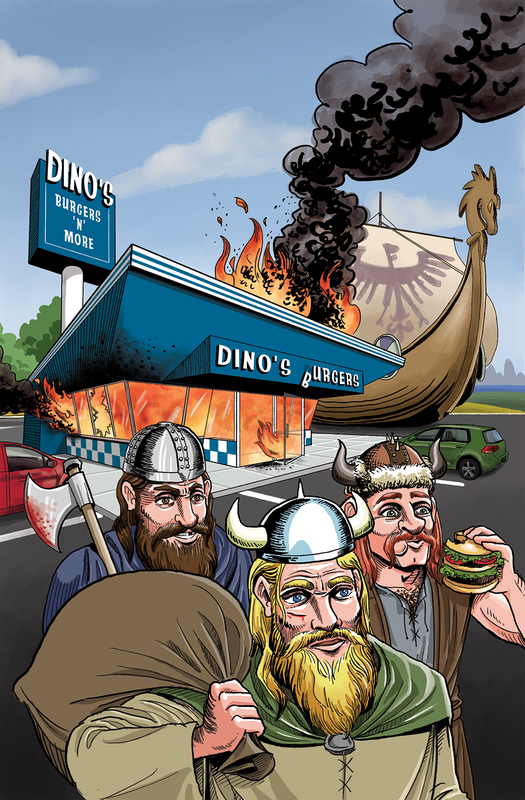 Vikings at Dino's and its sequel, Very Truly Run After, concern a young man named Michael Henderson who discovers that the world is far more complicated than he'd ever guessed when a horde of Vikings invade his favorite burger joint. His subsequent adventures take him through a variety of worlds, with predictably unpredictable results. My cover illustrations emphasize this anachronistic juxtaposition of worlds for maximum visual effect.